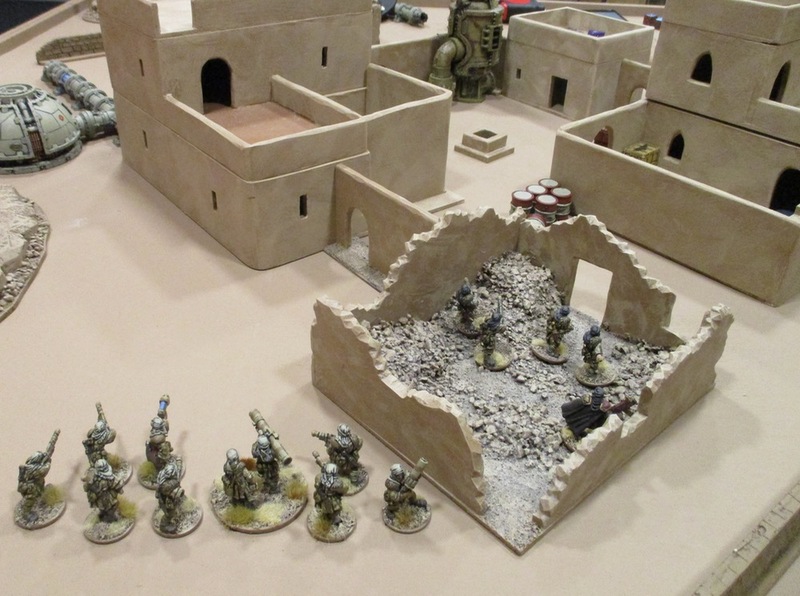 After a lengthy warp translation, the men and women of the 382nd Tallarn (Desert Raider) Regiment finally made it to the Xoxigar System. Other Guard regiments were in the System; the shattered remains of two Valhallan Regiments had taken up post on the frozen world of Xoxigar Prime - little action was expected there. The 222nd Guaiacan Commando Regiment was already in the thick of the fighting in the Jungles of Xoxigar Tertium. 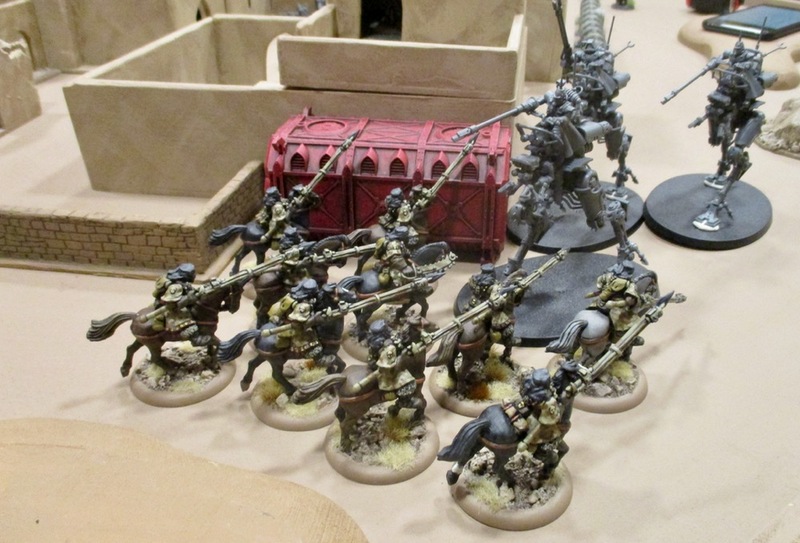 The Tallarn were earmarked for Xoxigar Secondus. There had been little fighting there, so far. 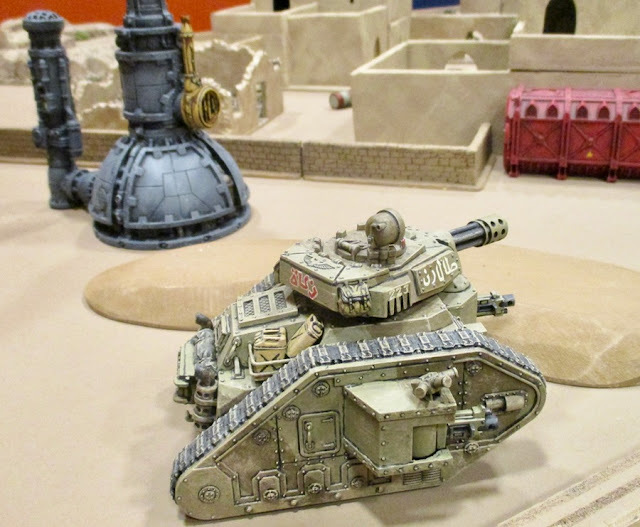 They were being sent to bolster the planets PDF and Skitarii Legions and protect the vital installations of the forge world. The 5th Company was stationed in the Southern Hemisphere, near vital promethium refining facilities and were set to patrolling the sprawling brownfield that surrounded the region. It reminded them much of home; dry and desert like, great patches of utterly toxic wasteland. Husks of long deserted communities. Word had come down from above that Ork landings had been confirmed on both Xoxigar Secondus and Tertium, and Tyranids were confirmed to have landed (in small numbers) on Xoxigar Tertium - but they were to maintain their vigilance and keep an eye out for ANY xenos presence. On this day, Lt. Anwar Al’Saphira of First Platoon, 5th Company, was making an initial reconnaissance patrol of his platoons area of operations. He took out two squads and had support from the regiment's Mounted Reconnaissance Squadron and a tank from #2 (Arkan) Troop, 2 Squadron 451st Tallarn Tank Regiment. There was not expected to be any enemy presence in the area. There was not expected to be ANYONE in the area - it had been depopulated ages ago, and was therefore a Free Fire Zone. If they ran into anyone out there, it wasn't likely they'd be friendly. As Lt. Al'Saphira approached an abandoned village - not even marked on his map - he received a panicked signal from the mounted patrol. They claimed to have spotted hostiles approaching the village from the other side. They were shrouded in some strange mist or smoke, but the patrol leader claimed he had spotted soldier shambling along in definitely non-human-like gait. He was quite certain they were the "Nee-Crones" he had read about in his Imperial Infantryman's Uplifting Primer. There had been no indication in the intelligence briefings that there had been any Necron activity on this planet, or the system, or even the sector! Al'Saphira scanned the horizon with his magnoculars and sure enough he spied grey metallic monstrosities shambling towards the village - and his patrol. He had his missile teams fire a couple of long range shots to keep their heads down and rushed towards the village! The scenario we played was the "Patrol" Narrative Scenario out of the main rule book - as it seemed to best fit the narrative for this little encounter. This was actually a league game for the Hunters of the Warp league here in Saskatoon - the current league - that's just started at the beginning of the year is an escalation league - first two weeks are 500 points, next two weeks are 1000 points. AS the league just got underway, we were playing with 500 points. Roughriders Squad (10) led by Sergeant Wazir – Attached from Regimental Mounted Company - 100 points. 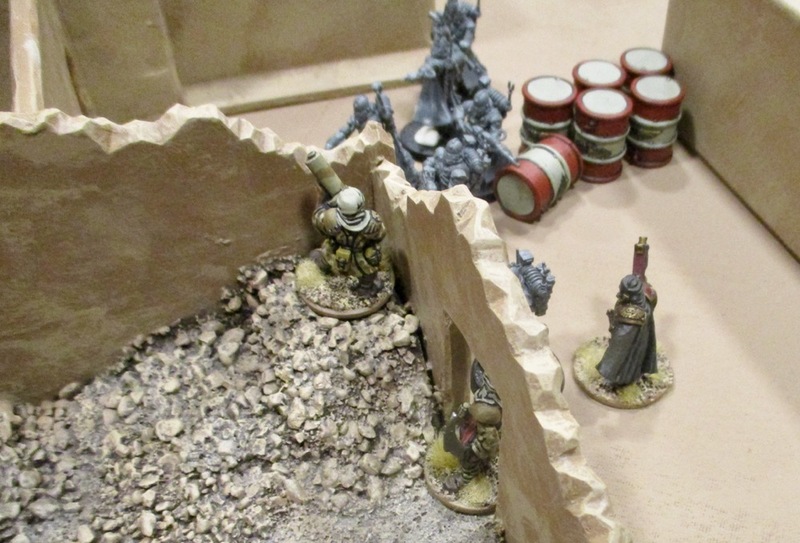 Lt. Al'Saphira rushed his troops up to a low wall at the edge of the village. Hostiles could be seen climbing ruined tower at the other edge of the village. first squad started taking fire from them right away - though the fire was initially infective. The sound of heavy foot falls could be heard comping around the south side of the village and great billowing clouds of smoke and dust could be seen riding above the buildings to the right. Al'Saphira figured this was some sort of xenos armour and his troops would be safer taking cover in the village and let the tank deal with the enemy armour! 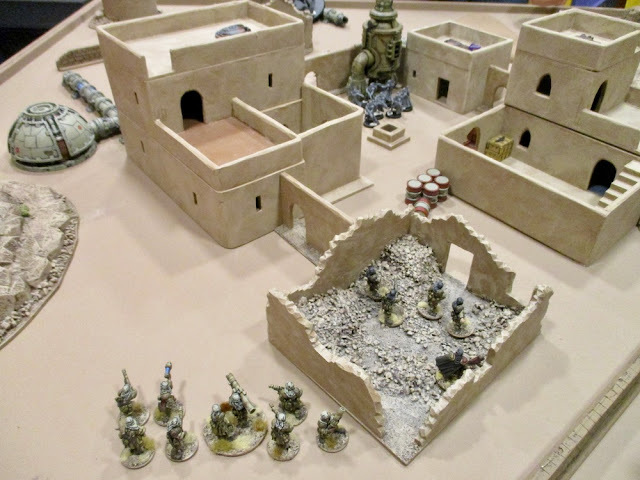 As first squad made their way up the street the fire from the snipers in the tower became more intense and two of the Tallarn soldiers went down as casualties. A second group of hostiles was spotted entering the village through a gate opposite the central square - their fire was even more intense and deadly - the remaining members of the squad were all cut down as they tried to dash for cover in the narrow alley. The Second Squad arrived and quickly moved up to support the Lieutenant and his command squad - who were now feeling quite exposed! 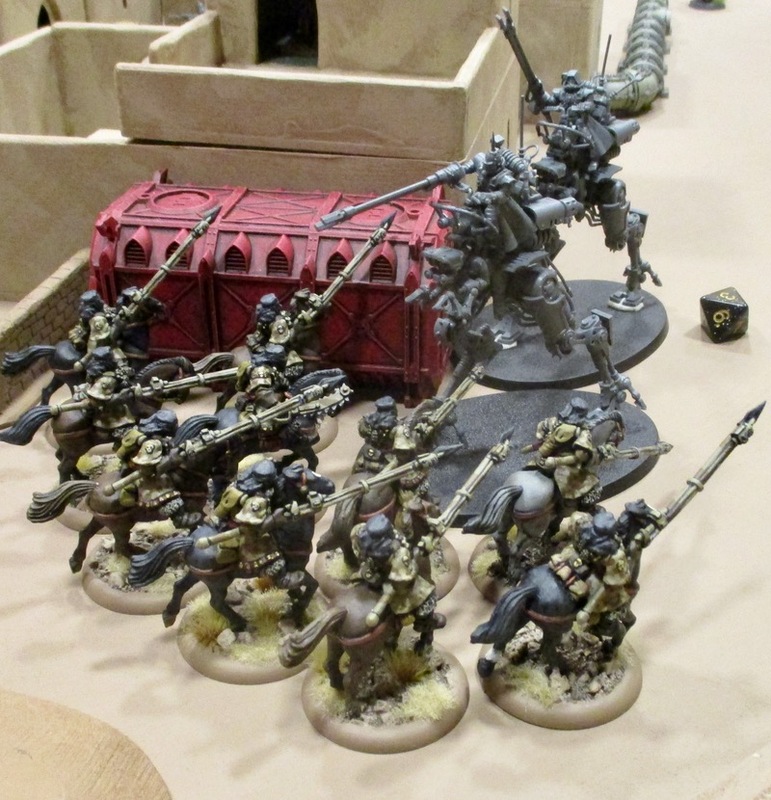 The Roughriders also made their appearance and immediately charge the giant grey-metallic, Xenos monstrosities they had spotted flanking around the south side of the village. They managed to take down one of the monstrosities and severely damage a second... But then the entire patrol was cut to shreds by a vicious counterattack! 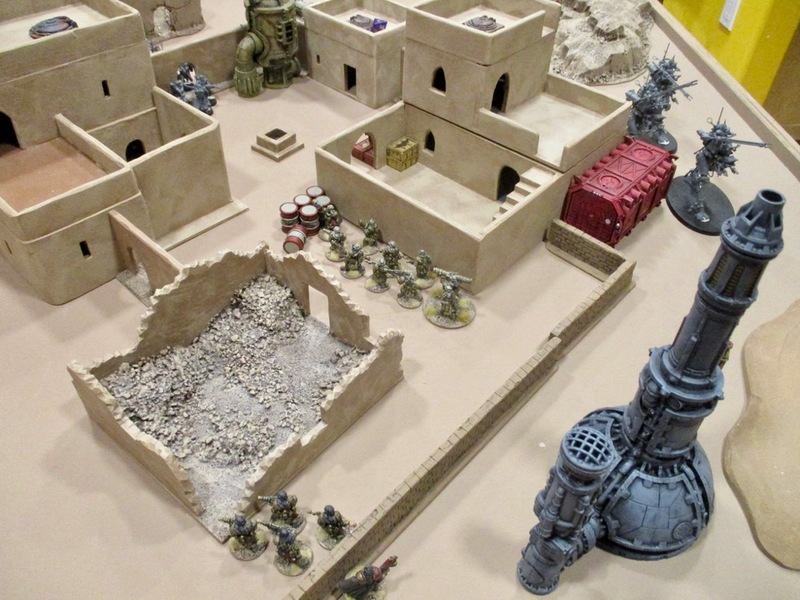 Second squad moved into the building and tried to bring fire down on the xenos scum in the middle of town, but their fire was wholly ineffective. The square was filled with a foul-smelling smoke and it was hard to get a bead on one of them. When they did, it was like their las blasts just bounced right off their armour. The unstoppable horde of robots surged forward - truly, these MUST be the frightful "Nee-Crones" they had read about in the Imperial Infantryman's Uplifting Primer! Checking on his casualties, he found one of his command squad and five others from the two squads of his platoon had been killed outright. Seven were severely injured and required immediate medical evac. The rest were all wounded, but only needed minor patching and would be able to make it back to the Forward Operating Base on their own. The Roughriders were a different story. nearly all of the horses were killed or needed to be put down, only two would serve again. Four of their riders were killed and three others were evacuated along with the Infantry. The other three limped back with their remaining horses. Two of the tank crew were also evacuated with grievous injuries. The rest of the crew thought they might have to sit and wait for an armoured recovery vehicle to come and tow them back to base, but conveniently the mechanicus were almost as good at fixing stuff in the field as they were at blowing it apart, and in very short order, they had it operating at an acceptable capacity to make it back to base. Despite the damage done, there weren't many hard feelings for the Mechanicus forces. 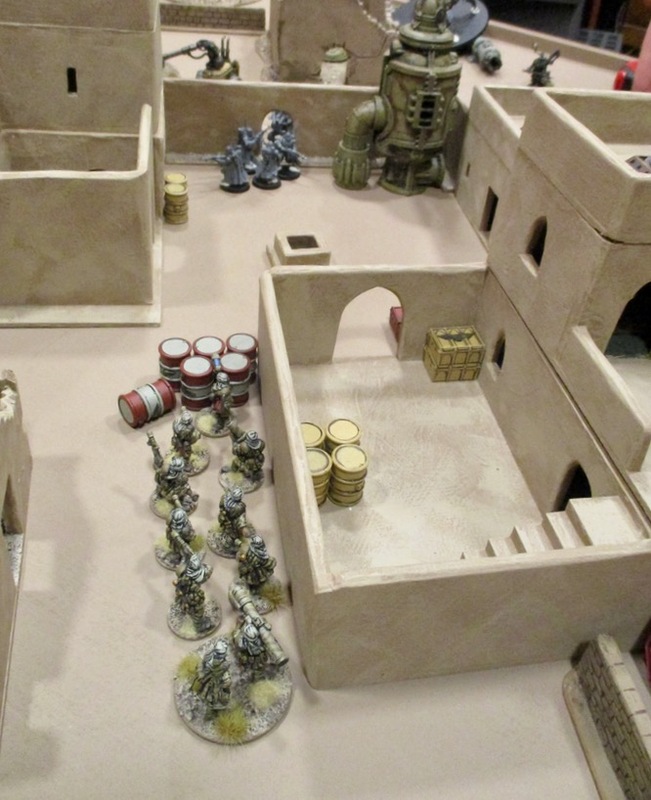 Mostly all were just glad to know these skitarii were on their side, as they surely would never want to face them again - and were happy to know, that if ever hostiles did show up, these guys would be fighting along side them! Originally when we set this game up I thought we might try out some of the forces we were going to use in the Battle of the Abyss: Team Apocalypse Event coming up in March.... but we've had some changes in or planned forces. Initially he was going to bring some mechanicus stuff, including a few knights. I was going to bring ONE of the Warhound Titans, the Shadowsword, and a small brigade detachment of Tallarn infantry.... but... then I got a second Warhound Titan... and then a Reaver Titan... and I kind of made a joke about bringing all three and how he'd have 30 Power Level left (from our combined 300!) - just enough to field a Valiant or Castellan knight... But he seems keen to try that out!? I'm not sure how well it's going to do. I think the Titans are a bit over-priced power-level-wise. Not sure how that's going to work, as theoretically we're supposed to have out own forces that are no bigger than 150 Power Level... Might need special permission from the organizers. Hopefully they'll go for it... because... TITANS!!! When, other than an Apocalypse event, am I ever going to get to field them all together. A nice battle report. 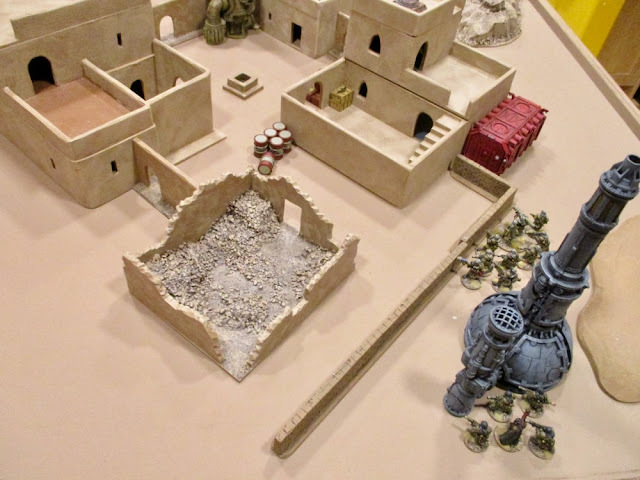 I had forgotten how frustrating Imperial Guard can be. Which really is the most important thing - I'm never going to win games through game play or dice-rolling! Cheers! Thanks, Suber! It was a pretty one-sided affair! "Frustratingly hilarious" is a pretty good description! Classic guard against shameful newfangled plastic... you can see why the men would think they were the enemy. Sweet Sally Jupiter! They want $143.65 for shipping to Canada! NIce battle report. Can you tell me which rule you use for this skirmish ? Kill Team ? Or W40K ? Thank you, Stéphane! We were playing Warhammer 40,000 (8th Edition). It was a smaller game as we're in an "escalation" league and the week we played the escalation level was 500 points. So we were both playing with relatively small patrol detachments. Kill Team doesn't use nearly this many figures - or tanks!